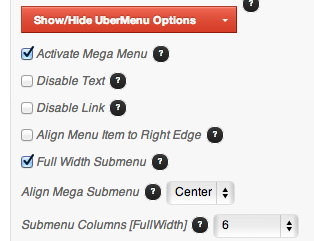 To create a mega submenu, just check “Activate Mega Menu” on your top level menu item. Adding normal link content to a Mega Menu is as simple as creating a flyout menu. Just make sure that Activate Mega Menu IS checked on the top level menu item. Second level items create column headers and third level items fill the content below those headers. See the Layout section for more information on how to create the layout you want.